Phi Phi Island – Just a short 90-minute journey from Phuket Island or a 60 minute trip from Krabi Main land, you will find the tropical paradise of Koh Phi Phi Island. It is the ultimate tropical getaway in Thailand with fine white sandy beaches and breathtaking rock formations rising from the Andaman Sea. The thing about Phi Phi Island is that makes it such a great travel destination is that Pee Pee Island caters to almost everyone’s tastes and desires. Whether you would like to do some excellent scuba diving, or like to go snorkeling, do some sea kayaking, maybe climb some rocks, just relax on the beaches or in the bars, or dance up a storm in one of its open-air discos, Pee Pee Island has what you want and then some. 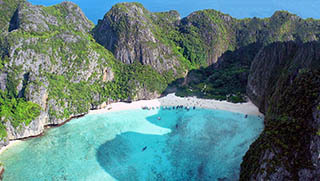 Check out our selected hotels in Koh Phi Phi Island. 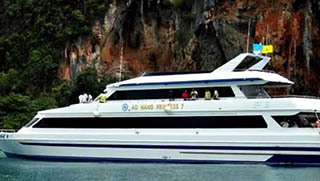 Contact Us now for All about Koh Phi Phi Islands Tours & Activities. Phi Phi island what can one say that has not already been said about these amazing group of little islands 45 km from Phuket and similar distance from Krabi. There are many ferries servicing PP throughout the day. You can catch a boat for PP from Phuket Town at several locations and there are ferries also from Ao Nang and Krabi port too. There are in fact six islands that make up the famous Koh Phi Phi Island group two to the north two in the middle and there are two little islands south of the main group. Bida Nai and Bida Nok these two sites are famous in their own right for scuba diving, many new divers have dived her for the first time. And many have seen some of the biggest fish on the planet roaming these waters frequently there are Manta ray and Whaleshark sighting as well as Black Tip sharks regularly spotted too. Phi Phi is a paradise Island, make no mistake about it. These islands are made up of sheer-faced limestone walls, which are topped in green tropical forest. Phi Phi, shot to fame in 2000 with the release of a movie starring Leonardo DiCaprio and Robert Carlyle, the movie, of course, is The Beach. The movie made Maya bay which is located on Phi Phi Leh (the second largest island in this little archipelago) the most famous beach in the world and only recently due, and mainly due to tourism it had to be closed. This allowed for the beach and nearby waters and corals to recover somewhat from the sheer amount of tourist this beautiful beach attracted. This closure has been a success with a large group of Black Tip Reef Sharks (harmless to humans) returning and feeding again. It has also given the time for the beach to be cleaned properly and there are rangers on here twenty four hours a day making sure that everything is cared for in the proper manner. There are two other islands in the north of the main island of Phi Phi Don The Islands are named: Bamboo, Mosquito, these two island are great for a day trip and snorkelling is recommended. As mentioned Bida Nai, Bida Nok are just south of Phi Phi Leh and the main Island of Phi Phi Don. 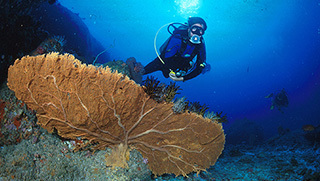 There are nineteen dive sites mainly around Phi Phi. These main dive sites make for fantastic diving for all levels, whether experienced or beginner. Phi Phi Don is the largest in the group and the only one which is inhabited. You will find accommodation here from the small little backpacker hostels and guest houses to some five star luxury resorts. There are restaurants to suit every taste, there is Scandinavian food, Italian & French cuisine, of course there is some fantastic Thai food and the market stalls offer some of the best Thai street food in the area. 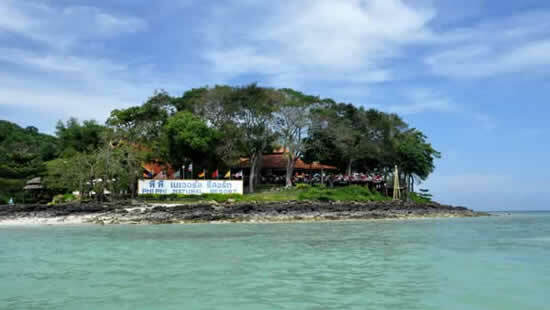 There are many bars to relax in, several nightclubs and sports bars, some fantastic shopping for souvenirs , internet Thai massage we strongly recommend a foot massage and the scuba diving and snorkelling is great too. You can go rock climbing, kayaking in and out of the coves and inlets and at certain times of the day you can snorkel with real life sharks as they hunt out in the early morning or late afternoon.